No USA falconry resource would be right by starting with any other bird than the Red-Tailed Hawk. Often coined as the “bread and butter of US falconry” the red tailed hawk is arguable one of the most versatile game hawks available for falconry use. They man down in short order and have been known to be hunting free in less than 10 days. My personal experience has been 2-3 weeks is what it takes to get a bird hunting although there are other falconers that regularly take 4-6 weeks and produce impressive game hawks. With red tail hawks it often seems the falconer is the one holding back, not the bird. Red-tailed hawks around the country are being hunted on squirrel, rabbit, pheasant as the primary quarries. Although a red tail is a very opportunistic hunter and the sitting crow, pigeon or duck is also fair game. Most commonly red-tails are simply flown loose and following. The red tail hawk will follow the falconer through the woods or down a tree line anticipating the flush. The first few hunts you’ll be abruptly awaked by the beaters shouting “Ho, Ho, Ho” every time a rabbit or squirrel moves. To the left is Richie and Sam Finch after a successful day in the field. As the season progresses the red tail learns to be a step ahead of the game and will often stick to the area immediately at the falconer in wait for the catch. They seem to quickly understand the advantage of having a human hunting partner. Adjacent is a short clip of a rabbit slip on a railroad bed by Archimedes, a male. He bound to the rabbit but it hit the brush fast enough to knock him off. Red-tails also tend to be very forgiving and patient with the new and experienced falconer alike. They adapt readily to the falconry lifestyle and tend to be very moldable into your hunting style. The birds don't seem to mind changing up their hunting style to take advantage of new slips and often chase near anything that moves. Adjacent is clip of passage red-tail, Scarlett, bring her squirrel up for her transfer. 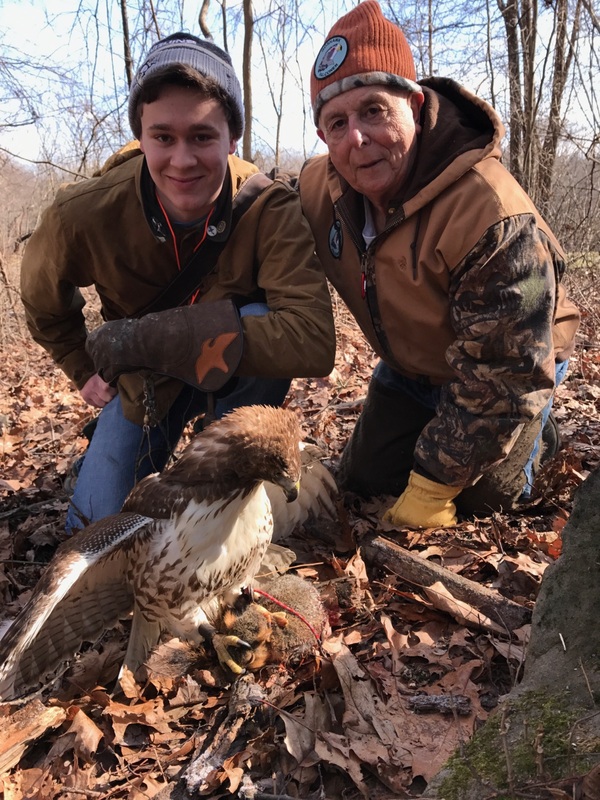 The red-tail will likely be your first bird as an aspiring apprentice (although some states permit the take of harris hawks and many permit kestrels) because they are a hardy bird that's relatively easy to get hunting comparatively to other raptors. 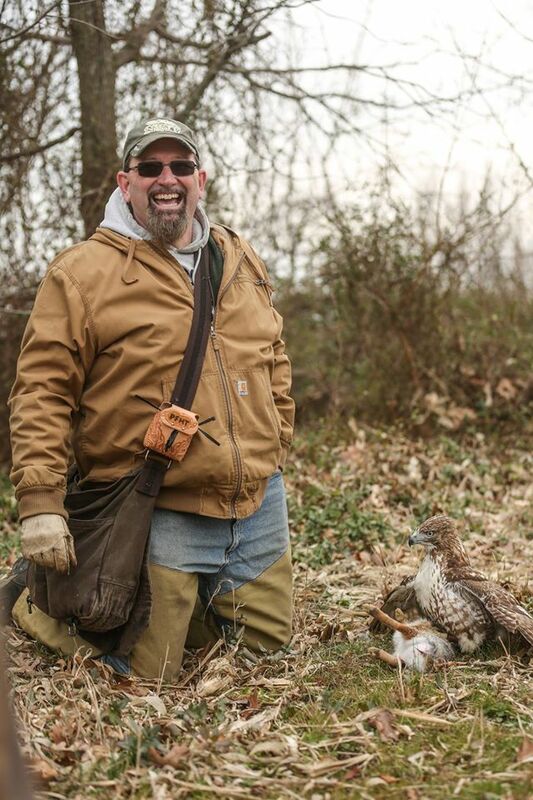 Many sponsors will require the use of a passage red tailed hawk as your first bird even if law permits otherwise. You'll come across a few mind sets in your falconry journey, and a common mantra heard as an apprentice is likely to be that you will release your apprentice birds. I also subscribe to this mentality. The belief is that you don't learn nearly as much by getting one bird hunting and just refining the hunting. You learn and absorb a lot more skills by flying multiple birds and addressing their individual quirks. It may sound like it's going to be very hard to release your bird, and honestly, it is. It's a bitter sweet feeling knowing the bird gave up a season to be stuck with some weird human who makes it's life interesting and now it's time for it go back to doing what it was designed to do. For every person that subscribes to this method, there's a falconer who will fly the same bird year in and year out. Every falconer wants something different out of their falconry and you may find yourself molding and changing as the years go on.